It was a pretty busy weekend for just two shows--one in New Orleans for a church building full of sweet folks, then a long plane trip to Denver via Nashville and Chicago, where we had the honor of opening for one of my favorites, Fernando Ortega. It was great to see him, though our hang out time was woefully short. I also had a good meeting with my editor at Waterbrook for my book, and finished Harry Potter, which pretty much wrecked me. Tomorrow Ben has a session with the infamous Ed Cash, so Andy G. and I will be recording guitars without him. I'll try to get a little video and/or a few pics and post them tomorrow night. Thanks for reading, and for those of you who came out to the shows this weekend. We had a great time trying out a few of these new songs. And yet another good day of work was had by all. We showed up at ten and decided to work on the guitars for a new song called (for now) Rocket. I'm not sure what the final title will be--I only know that I don't want my song to share a title with that Def Leppard song on Hysteria that I never understood the words to. I wrote the song about my family's trip to Florida to see the Atlantis launch back in June. My friend Pat Forrester was a mission specialist on the shuttle and we were able to view the launch from the VIP area, 3.5 miles from the pad. It doesn't get much better than that. I had prepared myself for the thrill of it, for the utter coolness of seeing a real-live rocketship blast into space, but I wasn't prepared to be moved the way I was. When that ship heaved away from Earth in all that smoke and thunder I had tears streaming down my face from the joy of it. Part of it was because I knew someone on the ship, part of it was because I was sharing it with my wife and children, and part of it is what I explored in the new song. Anyway, first thing this morning we spent a good hour or two working on parts. Parts are a Big Deal. I can't say enough how much difference it makes when a songwriter and his cohorts sit down and really think about what they're playing. It's easy (especially with this brand of folky-guitar music) to write a song and strum it without really thinking much about how to make the song beautiful, musically speaking. We spent those hours well, because what Andy G. came up with was just right. We're heading out for a show in Louisiana tomorrow, then Denver the next night with my old pal Fernando Ortega. Whom I love. Thanks again for keeping up with the process, and for showing your enthusiasm with the emails and comments. I'm so thankful to be able to make this record for you, and for the Kingdom. I hope it turns out to be a blessing. We'll see you on the road this weekend, and Monday we hit the studio again, bright and semi-early. Enjoy the video. We had another good day today. We recorded all the acoustic guitars for Don't Give Up On Me, and I sang and comped the vocal. Here's a bit of video for your viewing pleasure. ...the all-out war between the Death Eaters and the Order of the Phoenix. In other news, we began overdubs for the record today. I usually think of overdubs as the icing on the cake, where we sit around listening to the song in its nearly completed form, dreaming about what fun sounds we can slather on top of what's already there; this was just tracking the guitars. We showed up at Gullahorn's home studio, which is this cozy apartment-over-a-carport that's the envy of most of Andy's friends. He's got everything from a desk full of recording gear to Hatch Show Print posters for James Taylor and Sufjan Stevens at the Ryman to a remote controlled whoopee cushion. We got there at about ten and pulled up the file for the tracking session from a week ago, and I once again marveled at the vast difference between recording now compared to just a few years ago. When I made Carried Along in 1999, it was a big deal that we were using this big clunky state-of-the-art RADAR machine. It was basically a big hard drive that cost about a zillion bucks and was much more complicated than ProTools. Now, thanks to modern technology, Ben, Andy G. and I can do everything with basically a computer and a few pre-amps in a living room. I don't know what all those knobs and stuff do, but I can get around in ProTools enough to know that it's a genius of a program. So our weeks' worth of work was all on Ben's external hard drive, and with a few clicks we were able to listen to the tracks for I've Got News. They set up mics in the bathroom and I sat there with my geetar and spent the first three hours recording the guitar part. I've played this song probably a hundred times, and still, playing it with a click track is nigh unto impossible for me. I always feel like I'm completely incompetent and that a real player like Gullahorn should just come in and do the durn song. When I play live, I'm always slowing down and speeding up so that I can sing it like I want, but playing to the click is different. That metronome is like potbellied, whiskery viking beating a drum, and I'm a slave chained to the oars. Ben is a patient fella, and we took the song literally a measure at a time. I'd play until my timing was off (usually a few seconds), Ben would stop me, then we'd punch in on the next measure. Somehow, by the time we splice all those attempts together, the song sounds like I know what I'm doing. After lunch (at a questionable establishment called Silvan Park) I doubled the guitar part. Doubling an acoustic guitar part puts some meat on its bones, gives it a chorus-type feel, as well as smooths out some of the rough parts. Usually you pan the doubled parts to the left and right speakers, but we'll see what the mixing engineer decides sounds best. Gullahorn played his parts in about a third of the time that I did mine, because as I said, he's good. It also helps that we've been playing this song on the road for several months so we already have our parts worked out. Finally, I sang the song. Usually the vocals come later in the game, but we decided to go ahead and get this one out of the way. I sang the vocal about eight times through, then once Ben thought I had enough to comp it together, he went home. I stayed by myself and comped the part. Comping is when you piece the best parts of each performance into one uber-track. I listened to each phrase in each pass, grabbed the best one and slid it down to the comp track, so the final deal is lots of bits and pieces that are glued together so in the end you'd never know it just by listening. That was our day. It's 11:27 here at the Warren, and Harry Potter is calling my name. We took some video of today's work, so I'll upload that tomorrow. I'm back from vacation with my family, and we were planning to hit the studio tomorrow bright and semi-early, but someone had a conflict and we got the day semi-off. I'll be answering emails, making sense of my office (which still hasn't been sorted out since our move), and taking care of some details regarding my novel. I dug up a few more clips of last week's tracking session, where we're working on a semi-new song called The Good Confession. It's a song that I've been carrying parts of around for a few years now and just managed to finish it a month or two ago. I've heard these big, epic drums and guitars and strings in my head since I wrote it, so it was satisfying to hear Paul and Matt nail it. It's semi-one in the morning and I'm semi-tired. Have a great Monday. 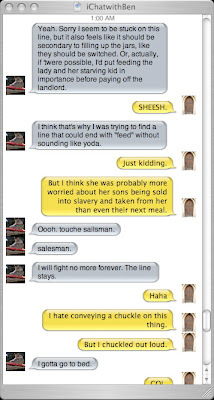 I found the rest of the iChat between Ben and I and here post it for your perusal. I'm not much of a co-writer, but it was nice in this situation because we were able to think about the song in private and share it with the other guy when we were good and ready. The few times I've ever tried writing in the same room as someone I've frozen up completely; I can barely remember a G chord. Like online dating, this provided boundaries in which we both felt comfortable to put up a front--er, to be creative without the hindrance of insecurity. I present to you, dear friends, on this the night of the release of Deathly Hallows, my final case for the genuine, bewhiskered, and best Dumbledore. This is Ben writing. Let me just get this out in the open. I have a blogging problem. I want every entry to feel like my magnum opus (a big penguin?) so I never end up posting anything. So here's my plan: I'm going to post a series of blogs this week with short subjects so's I don't get to intimscidated. Incidentally, I changed into Popeye about halfway through that last sentence. Believe you me, anyone can make a great record. Here's how. You hire the very best people. It's that simple. Well, it's almost that simple. First you need great songs, I suppose. If your songs are terrible (and there are sadly a great many well-meaning but terrible songs in this world) you cannot make a great record. But once you find yourself sitting on a pile of finely woven songs (the work of a skilled craftsman), you are ready to hire the very best people and make a great record. Ah, but who are the very best people? Well, that depends on what you think a great record is. If you really like Wilco (and I really like Wilco), then the very best players might not be the very best players. You might do better with good collaborators who don't always play in time. People whose playing has more personality than perfection. And if you really like Hem's first record (and I really like Hem's first record) then your best tracking engineer might not be the obsessive audiophile with the huge snare sound at his fingertips. What kind of record do you want to make? Who can help you make it? You'd better think good and hard about this. We hired Paul Eckberg to play drums. I don't have any experience tracking kit with Paul, and I've really only ever heard him play someone else's parts live. So I didn't much about what he creates in the studio. Neither did the Andys. Here's why we hired him. We knew he was a hard-hitter. AP and I figured out that part of what we love about the Rich Mullins records is that even though much of the instrumentation is what we'd call "organic," the drums are huge and bright and clear. You need a hard-hitter to get those kind of sounds. Secondly, we knew Paul would crack us up for three days straight. That kind of thing incredibly valuable to a record. Happy, comfortable people are more able to make music from their hearts. Thirdly, we knew that Paul would prepare himself for the sessions if given the opportunity and would work obsessively to make things great. Paul is a detail person. We hired him one time to sub a christmas show and he made immaculate charts (sheet music) and read them perfectly during the show. Didn't miss a beat. So, Paul Eckberg, ladies and gentlemen. Matt Pierson, our bassist, was my call. I met Matt on one of my first Ed Cash sessions years ago and have always loved him to death. AP didn't know him from Adam, but now he loves him about as much as I do. Once again, I hired him for who he is as much as for his playing. He's the kind of guy who remembers your name and says things like "you're a dear!" Actually, I'm pretty proud of an idea I had concerning him. I called him the day before tracking just to brag about AP's songwriting. I wanted to get him excited about what he was walking into. I knew however high his expectations were, AP's songs would deliver and Matt would respond with all kinds of encouragement. I was priming the pump I guess. And it worked. Matt made AP feel like a million bucks the whole time, bragging on his songwriting. And of course, Matt in turn worked a little voodoo of his own. Andy Hunt, our engineer, worked on Derek Webb's last record, the Ringing Bell. I've also done a bit of keyboard stuff for some of his productions over the past year. The Ringing Bell wasn't the right engineering reference for this record since the sounds are super old-school and nothing like what we're going for, but I figured he could ace the modern sounding drums, especially since I know Chris Lord Alge (the hi-fi mixing champion of our age) is his hero and because he gave me a Fall Out Boy cd as a gift. He's a funny guy as well. And he did great. I was hired mostly for my good looks and charm, as was Gullahorn. I wont pretend the moral of the story is especially earth-shattering. In fact, I can't figure out how to sum it up without sounding cliche. So I'll just say it. When we were putting this team together, we cared deeply about the skill of the players, but we were just as concerned with insuring that the dynamic in the studio would be friendly. Go now and do likewise. I'm starting to fear that my readers might just think I'm as dumb as I look. The Dumbledore thread is a joke. This is only a joke. A joke of the Emergency Broadcast System. 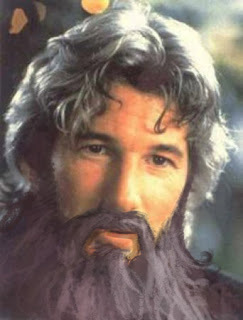 Everybody knows it was Derek Webb who played Dumbledore. This is Ben posting. I've got a short window of time to write this post, so I'll save my thoughts on our tracking sessions for later this week. For now, I'll share a story from last week that offers some insight into the writing process. As Andrew and I carpooled home from Wednesday's session, he mentioned to me that he was still in writing mode for this record. He loved the songs we already had in the docket, but didn't feel like the record was a closed canon yet. I mentioned that I had a song-start and he asked me what it was. I've had this song in my back pocket for maybe a year. It began when I was reading Old Testament stories to my kids one night. My kids are young, so I was reading out of one of these super-paraphrased picture Bibles. That night I read the story of the widow's oil as well as the story of Naaman, both from II Kings if you're not familiar with them. Something about telling these stories to my kids in their most simplified form really brought home the symbolism to me. The widow's oil and the Jordan river were clearly the blood of Jesus. I never sat down to work on the song and it remained in this form...until last week. BUM BUM BUUUUM!!! Andrew liked the idea and said he'd get to work on it. The next day he had something, which he sang to me in the car on the way in to work. I was relieved that the music was a little rolling tune, kind of like a weepies song and that he had a first verse. We were, of course, busy all day, but both of us were chomping at the bit to work on the song that night. As I cleaned the fridge that night I was in the famous writing zone. I went over and over the ideas in my mind, coming up with line after second-rate line, then occasionally stumbling on a new idea that sent me in a fresh direction. So after a lot of thinking on both our parts, we finally met up on iChat late that night. Here is the transcript of the first half of our conversation. That's AP on the left and me (with the hoverboard icon) on the right. It is, at points, difficult to follow because of the way iChat conversations tend to go. Also, I realize that these windows appear comically small, like stonehenge in spinal tap. If you really want to read them, maybe try saving them to your desktop. At this point, AP invites me to an audio chat, and then we text some more, but I don't have the rest of the rest of the conversation. I wish I did because we all but finished the lyric that night and were able to track the song the next day. I submit this because I think it's a pretty true picture of how a song comes into being. I know that when I was still wishing I could write a song and had never been able to, the most helpful thing for me was to learn (from AP and Eric Peters and Laura Story, specifically) that writing is just work like anything else. It begins with a creative spark, sure, but then you just have to swing the hammer for a while. Well, good people, I'm off for some family time. We're kicking back in with the record next Monday, but this week I'll be in a little cabin with Jamie, the kids, and my in-laws. The jokes would be easy to make at this point, but they don't apply to this situation. I'm looking forward to some time playing Texas Hold 'em and marbles with my dad-in-law. I just found out that the cabin has high-speed internet, which means that in my pathetic-ness I'll be waiting until the folks head to bed then I'll tiptoe out to the main room to update the blog with something. I have a few more videos from tracking last week to post and if I can think of anything else relevant to the point of this grand experiment, I'll put it up. Thanks for reading, you guys. P.S. I'm also going to be preparing my heart and mind for the end of Harry Potter. The book comes out next week, and I'm excited and sad at the same time. I'm also sad that I'll be picturing Michael Gambon as Dumbledore instead of the late great Ed Harris. I mentioned a few days ago that a special guest showed up for our second day of tracking. He ended up hanging around the studio for quite a bit and even went with us to lunch, where we bumped into a few interesting folks. It was an honor, and I sure hope he's able to visit more often. A picture from the last day of tracking Resurrection Letters. Yup, that's the album title. Greetings, good people of the interland. I didn't have much time to write yesterday because it was a busy one. We only tracked two songs Wednesday (Windows in the World and Don't Give Up On Me) because of all the set up. We didn't even get started until about 2 pm so getting two songs was somewhat of a surprise. You can see in the video how we're watching Paul and Matt on a monitor. That's because in Paul's studio, the drum/bass room is downstairs. We could talk back and forth via the millions of patch cables and microphones, but being able to see the guys makes it much easier, if only psychologically. Whenever Paul needs to talk to us we can hear him pretty well through his drum mics, but Matt's bass was a direct line so he had to yell across the room so the drum mics could hear him. We were fresh out of free channels so we couldn't set up a mic just for that, and I made some joke about walkie talkies. Then someone (I think it was Gully) suggested a baby monitor. I promptly called the Osengas (who live about fifty yards away) and appropriated theirs. (Sorry Ella and Sadie, you're on your own. Adulthood is thrust upon us, young ones.) So Matt was able to talk to us without having to yell, plus whenever he felt alone and started crying we heard and came into the room to swaddle the li'l guy. That night on the way home I mentioned to Ben (we carpool because we live just a few minutes apart these days) that the book wasn't closed on songs for the record, so if he had any song ideas floating around to let me know. He told me about an idea involving some Old Testament stories and I perked up. I worked on it a little bit that night (until 2 am or so) and played it for him the next day. He liked it. Yesterday (Thursday) we tracked a new song called Rocket, Invisible God, The Good Confession, and All Things New. Four songs is a lot for a day, and we didn't finish up until eight or nine. Just before we left the studio I played Ben's new song idear for Andy G. and he really liked it, which gave me a little more of a push to finish the thang. On the way home Ben and I wrote a little more, and when I dropped him off we agreed to call if there were any fresh ideas. So that night after folding the laundry with Jamie and wrestling with the kids I signed on to my iChat account and Ben and I finished the song via the interweb. 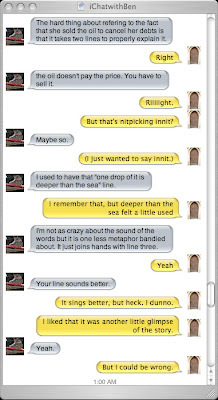 I wonder if it's the first song co-written on iChat? I saved the transcript for posterity. Anyway, I say all that to say that today we tracked the new song, called All You'll Ever Need, then I've Got News, and Love is a Good Thing. We had a celebratory meal at Ted's Montana Grill (which involved a bison burger with bacon for me) and wrapped the tracking session. It was a good three days. The Lord knows I've been in some stressful tracking sessions, so it was a great blessing that everyone got along well, the parts were relatively easy to find, and everybody I'm lucky enough to be working with on this album is really, really good at what they do. Oh, and I went to see the new Harry Potter film with Ben and his brother tonight. I would give you some sort of review but the late nights this week caught up to me and I slept through about a third of the movie. One thing is certain, though: I missed Ed Harris as Dumbledore. The new guy just doesn't cut it. Many people have disbelieved my post entitled "Correction," saying that I once again mistook which Richard performed the most excellent Dumbledore. I offer the following as proof and I rest my case. Here are a few clips I put together from yesterday's session. Andy G.'s working on his video of our special guest in the studio and we'll post it as soon as it's finished. In the meantime, please enjoy my less-funny self. 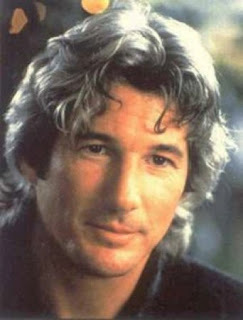 By the talented late Richard Gere. We started at nine o'clock and Paul and Andy Hunt set to plugging in cables and setting up the mics. Ben, Andy G. and I played through three songs for Matt Pierson. Matt's a bass player who's been around the block about eighty more times than any of the rest of us, but he's humble and encouraging and a blessing to be around. It's so nice to find a player who's great at what they do without being cocky or aloof. Matt listened to Gully and I play Windows in the World, Don't Give Up On Me, and a brand-new song with the working title Rocket. He charted the songs and then to my delight asked us to play each one again so he could read the lyrics. This is rare for a studio musician, and I loved it because it meant that he cared about the songs. We took a break for lunch at good ol' Baja Burrito and saw a bunch of friends and music people stuffing their faces with the best burritos in town. Andy G. is the unofficial videographer for the record, and he documented some of the process along with a very special guest. As soon as he gets the video made I'll post it for your viewing ecstasy. After lunch I sat in a room with a mic, Andy G. did the same, and Paul and Matt were set up downstairs near each other. The songs sounded just great with these guys playing on them. Remember yesterday when I was writing about how songs usually don't sound right the first time I hear them with a rhythm section? Well this time they settled in easy. Paul's drumming was solid and tasteful, and Matt was right there with him. Tomorrow we're hoping to get started faster and track four songs. The yard of Appendix a has been mowed. All that's left is the edging. I'm waiting on the licensing for a couple of songs (Sun on the Moon, by James Taylor and The Color Green by Rich Mullins), and if/when I get the legal stuff straightened out the record will be off to the printer. I think we'll start pre-orders at the end of this week. As for the album, tomorrow's the big day. I feel nothing but excitement. The songs are ready to go, the details are lined up for tracking, and all that's left is a prayer meeting tonight with Ben and breakfast in the morning. When we were making Love and Thunder with Steve Hindalong and Derri Daugherty we met at a place called Five and Diner in Brentwood for breakfast most mornings of the tracking process. Steve said he liked to get everybody together hanging out for a little while before they headed into the cave and set to work, that it helped with camaraderie and focus. Also, omelettes are nice. So tomorrow morning I'm meeting Ben at the ol' Cracker Barrel for some fattening scrumptiousness before we press the record button. In answer to eiszoe's question about tracking, the answer is a scratch track. You find the tempo for the song and usually you play into a mic while the bass player and drummer are recording. You're recording your scratch vocal/guitar at the same time, and hopefully by the third take or so you've performed it well enough for them to follow you and you can come back to the control room to listen to their additional takes. It always feels weird hearing an acoustic song with drums for the first time. This is when you hash out the particular pattern for the drummer, because as you know there are about 50 ways to play each song, rhythm-wise. I have to place a lot of trust in both the producer and the drummer at this point because they're hearing the big picture in ways that I sometimes can't. I remember with Pillar of Fire I was worried about what Ken Lewis was playing on the kit because it didn't groove the way I wanted it to. He kept telling me to wait for the percussion. When he finally got around to perc he filled in holes he had been leaving open with the kit and voilá, there was the groove. Lesson: always trust Ken Lewis. Most times my gut reaction is that the songs feel all wrong with the drums, like they feel too fast or too funky or something, but the next day they sound just fine. Tempo has also been an issue for me. Ben and I have sworn to speed up each song by about two clicks from where we think it should be. Several songs on the last few records have felt a teeny bit too slow, and I think the reason is because I had a hard time singing them faster. I like to enunciate my words and make sure the lyric is discernible, and when the tempo is too fast it bugs. But some songs felt way too fast when we recorded them and once the record was finished they felt too slow. So two clicks faster this time. At least. So John, you have to get used to playing your song with a click, then record a scratch vocal and guitar to it, if possible while the drums and bass are recording. It feels more natural that way. It's also a good idea to make the scratch as good a performance as possible, even though you won't be keeping it; all the other musicians will be playing to it until you get your final vocal/guitar done, and if it's bad you end up feeling lousy and apologizing over and over. If it's good, they can focus on the song and maybe even get excited about it. I was up until about three last night working on Appendix M. I'm trying to finish it up by Tuesday night so that Wednesday I can focus completely on tracking. Last night I was working in ProTools, editing and mixing a little guitar/vocal/accordion version of a song I wrote with Ben called Further Proof. Friday after the INO guy left Andy's studio we threw up a mic, which sounds gross and impossible, and I played through the song in one take. Since Ben was there and there happened to be an accordion on hand he played through two passes of the song and we were done. It doesn't get much easier than that, ladies and germs. So last night I had to open the files on my computer, get the mix right, EQ it all (though I haven't a clue what I'm doing) and add the song to the list. I wanted Further Proof to be on this Appendix because it's another example of a song that I like but that won't really fit on a regular album. Ben had the idea for the song and mentioned it to me back when we were about to start on Love and Thunder. I finished the song and realized during a Weaklings meeting that it didn't really belong on L&T. So what do you do with a song like that? That's right. 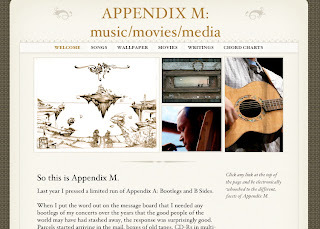 Appendix M.
I woke up this morning and worked on editing the journals and writings that'll be on M. That's been the most tedious part of the process by far, and not only tedious but downright depressing. I've got a lot to learn about the written word, but some of the journals I posted on my website years ago were just embarrassing. It was a relief to see that my writing got (a little) better over the years. Meanwhile, Ben met at Paul Eckberg's studio with Andy Hunt, our tracking engineer. It's important to get your ducks in a row before tracking because it's an expensive waste of time if you realize the first day that you don't have enough headphones or preamps or whatever. The clock is ticking, and the musicians aren't free. So Ben, Paul, and Andy compared notes and figured out exactly what gear Paul already had and what they'd need to supplement a full tracking session. About Paul. He's awesome. When he's not on the road with Chris Rice or Mark Schultz or whatever famous person he's playing for, he goes to my church. Paul is like no other dude I've ever met in that he's delightfully funny and hopelessly type-A at the same time. The first few times you're around him and his computer you're treated to a long routine of bad demos he's compiled, mp3's of funny voicemail messages he's gotten from friends, and (my personal favorite) his montage music. He found music that sounds just like the music from an 80's movie montage, like where the characters have to get a float ready in time for the big parade so that the Homecoming Queen with Big Hair will meet the Nerd with a Big Heart. As Paul plays the song he describes what happens during the montage. While it may not seem hilarious now, if you're ever lucky enough to experience the Eckberg Montage Routine, you'll see what I mean. You may lose weight from the laughter. So that's what happened today. I'm off to work on some more Appendix M mixes, then I have to find somebody to master it, like, tomorrow. Not sure how that'll happen, but it must. It must, I tell you. So here it is, ladies and germs. I'm going to try my very best to update daily the progress of the making of the new record. I have a title in mind that I'll reveal once I have a chance to talk with the Captains about it, but in the meantime I'll call it Doug. Doug has been on my mind for about a year. I decided early this year that Summer 2007 was high time to make a new record since The Far Country was released way back in 2005. In the meantime I released Appendix A independently and Slugs & Bugs & Lullabies with Randall Goodgame, and while those projects were fun for me (especially Slugs), I was ready to enter the cave and find another collection of stories and songs that I'd consider a Real Album. In my composition notebook I'd been scribbling notes and song titles and journal entries, my usual process of excavation, and was a little worried that I might not have the songs in time. This worry was gnawing at me even two weeks ago. But this past weekend I played a show with my buddy Randall Goodgame, and on the long drive home I got out a guitar and played him all the new songs. He was his usual encouraging self, and for the first time I felt really excited, like maybe I had the album after all. The next day, last Monday, I drove to Ben Shive's house to begin preproduction. John from my messageboard asked about what goes into this part of the process. I'll just tell you in a nutshell what Ben and I did that day. I broke out the list of songs, Ben got out his Mac, and I played through each of the potential songs on my guitar. We'd decide whether or not a certain song should modulate to a different key, we'd decide whether or not the key I wrote the song in was the best key for my voice. Ben would tap out a tempo with a little widget on his computer and I'd try playing the song to the metronome to see if the tempo felt right. We also discussed arrangements. Ben, Andy and I have been performing several of the songs for a while now, so the arrangements are already hashed out. With other songs, though, we needed to figure everything from background vocals to how many beats to hold a transitional chord before landing on the chorus. The next day we met at Ben's house again and further fine-tuned the arrangements by recording the songs. I sang into Ben's computer mic and record it with GarageBand, a simple Mac program. It didn't need to be a fancy recording; we just needed to be able to listen to the song objectively, plus it helped to have the pressure of performance, even if the performance was for a computer. The rest of our time was spent figuring out logistics. We scheduled our tracking days at Paul Eckberg's studio. We tracked down a guy named Andy Hunt to engineer. We found a bass player named Matt Pearson. Andy H. and Matt are both guys that Ben's worked with, and Paul has been on the road with us several times over the last few years. He's a good friend and a great drummer. Finally, we met Friday morning at Andy Gullahorn's studio to rehearse for a kind of a showcase for INO Records. It's a great label, according to Sara Groves, Derek Webb, the Caedmon's Call guys, and others I've talked to who have worked with them. I've been without a label for a few years now and felt compelled to at least pitch Doug to INO to see if it's something they'd like to carry. Recording these last few albums independently hasn't been without drama, but it's been really rewarding. In many ways I prefer it to the label world. Even so, having a label in your corner can be rewarding too, as long as the fit is right and the company is good. So he came by the office and sat on the couch while the Captains and I played through most of the songs. He took the lyrics with him to mull it over. I hope it works out, but if not, the last few years of independence have shown me that things will be fine, one way or another. God has proven himself faithful. I'm finishing up Appendix M over the next two days and we start tracking Wednesday. I'll write more tomorrow. I apologize for the tedium of this post. I won't have so much catching up to do next time, so it'll be shorter and (hopefully) more entertaining.